Like a Watchtower, Dr Miller? I KNOW exactly how writer Alan Bennett must have felt when he heard a Jehovah Witnesses blitz hitting his Camden Town street. According to his diary of the year – published in the current edition of the London Review of Books – he lay low until the coast was clear. But, inevitably, his polymath neighbour Sir Jonathan Miller was more than keen to take up the challenge of a doorstep debate. Assured of a “warmer welcome” at Miller’s Gloucester Crescent home, the Witnesses were soon assailed however by an onslaught only Miller is capable of. “Jonathan Miller is never wont to turn down the chance of a debate and likes nothing better than a brisk canter through the arguments against the existence of God and the literal truth of the Bible,” writes Bennett in his entry for March. “Two hapless evangelists had just had half an hour of this and were staggering down the steps licking their wounds when they spotted, parked in the street, a Ferrari. “In some relief they were admiring this superb machine, not realising the sourge of God still had his eye upon them. 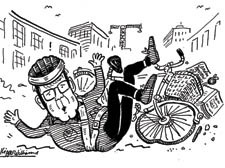 In an entry for May, Bennett describes an “absurd accident” on his bicycle in Gloucester Avenue when his raincoat got caught between the brakes and the wheel. Trying to take his coat off, he fell to the ground and landed “painfully on his bum”. He lay on the road for a moment or two, waving his legs in the air like Kafka’s beetle (a character in Kafka’s novel Metamorphosis, turns into a beetle – Ed). “Another passing pensioner, seeing my plight, goes to a friend’s house for a pair of scissors to cut me free, except that the friend is out,” writes Bennett. So Bennett limped home, eventually managing to free the wheel without having to cut the coat. CLEARING out his mother’s attic ­uncovered a remarkable find for Dan Segal. Amid the jumble and bric-a-brac, he found a rolled up piece of cloth. And he was on the point of consigning it to the dump when his wife ­suggested he lay it out to see what it was. And there it was, in all its glory: a historic Labour Party banner that had been put in the attic by his late father at his Hampstead home and forgotten about. in Grovesnor Square in 1968. ONE of my favourite writers was Chaim Bermant, a unique ­figure in British ­journalism. Often, I confess, I’d buy the Jewish Chronicle ­simply to read his ­latest humorous and profound observations. Bermant, who died nearly 10 years ago, is remembered in an ­exhibition of portraits – mainly by his widow, Judy – which opens on Sunday at the Ben Uri Gallery in Boundary Road, St John’s Wood. The Chief Rabbi Lord Jakobovits described him as “Anglo-Jewry’s voice of conscience”. I prefer his own description as a “licensed heretic”. A PROSPEROUS new year? Season’s greetings from Dartmouth Park’s Ronald Stamper and his partner Judith Walker this year were a little more complicated than that. Friends didn’t get the normal card, they got an e-polemic about money. And, with the world economy in jitters, it’s a fascinating read. Ronald asks: what is money? And he destroys a few myths about it. Most people, he says, believe that if they borrow £100,000 from the bank for a mortgage, that capital consists of money deposited by others into the bank. It is not. Rather the banks need around £10,000 of such money but the rest they create as new money. Moreover it’s the banks, not elected governments, that control the money supply. The whole system is inherently spectacularly unstable.